If possible, make sure your brand owns all URLs and account names associated with your name. If fact, it’s a great idea to do social media profile research before choosing your business name. If you choose a business name that already has 12 different Twitter profiles with different variations of the same name, perhaps it would serve your business better to choose a more unique name. Once you know your business name, go through and sign-up for all social media sites with the same branded name and URL. Even if you’re not planning on utilizing a certain account for awhile, sign-up for it anyway and “hold” the name for your brand so someone doesn’t start a profile under your business name that could detract from your brand. Use simple monitoring or social media listening tools such as SocialMention to uncover potential branding hiccups. Search for accounts that could be using your brand name and other ways your brand could be misrepresented online. It might also be a good idea to conduct a social media competitive analysis to see how your competitors are using social media — and potential branding fails you could stay away from. If you discover a fraudulent account, there are processes with most social media sites to claim an account that infringes on trademark such as Twitter’s Trademark policy. If you can’t reclaim the fraudulent account, then be sure you monitor it closely in case your customers are reaching out and interacting with the account. It’s a good idea to create one document — in a secure business cloud solution such as Dropbox or Google Docs — that lists all passwords for accounts the brand owns. That way, if there’s a change in management or an internal social media role, your brand doesn’t have a bunch of accounts they can’t login to. A lot of brands get their hands slapped online because a social media manager posted a controversial message from a branded account. It happens when juggling multiple accounts and often responding on-the-go from a mobile phone. (Such is the life of a social media manager). The safest way to avoid this is to ensure a separate, mobile-friendly social media management app is used for your brand, and your social media manager doesn’t have their personal accounts tied to this app on their desktop or on their phone. Do not allow your social media manager to sign up for all of your brand social media sites with their email. If they leave and the email is removed from your business, then you won’t be able to access your social media accounts. Instead, create a custom email for social media such as social@yourdomain.com or yourbrandsocial@gmail.com. 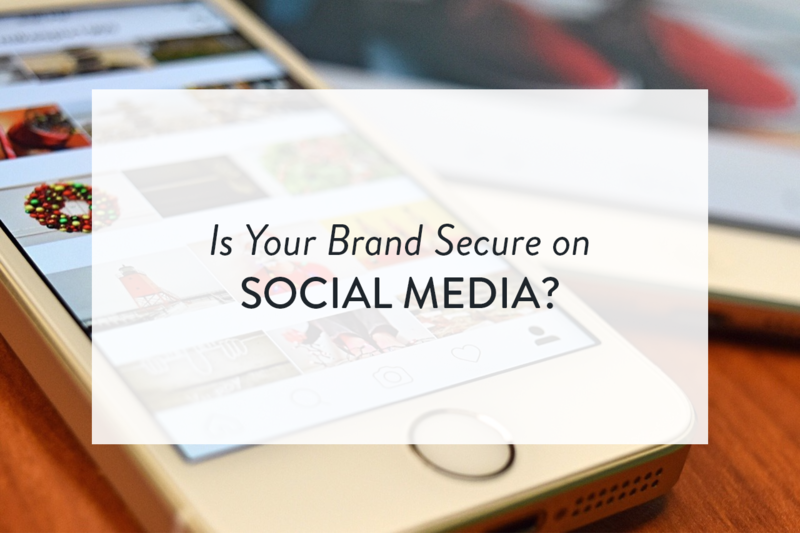 Spend some time internally talking about what social media security looks like for your brand, and loop in your infrastructure team or your legal counsel. How do online branding disasters get escalated and what is the process to fix them quickly? Do you believe your brand should stay silent online or address a branding failure directly? What is your brand policy for employees responding to customers online or sharing internal brand news? Lay all of this out within your social media policy then share the policy with all employees. How your business is represented online to your customers is important to the image of your brand. A number of customers will reach out to your social media sites to ask for customer service help. To avoid a branding fail such as angry customers amplifying a problem, make sure your customer service team and social media team are closely aligned — even working within one platform together to solve social media problems. Make sure you’re always doing your due diligence as a brand to be sensitive to online topics. Don’t “highjack” a sensitive hashtag such as #blacklivesmatter to make it a marketing message for your brand. And if there’s something major happening in the news such as a terrorist attack, it’s best to err on the side of staying silent on social media that day so that an insensitive marketing message doesn’t pop into your followers’ news feed when they might be processing upsetting world news.